For understandable public health concerns and environmental considerations, European authorities are keen to ensure that heavy metals, and in particular lead and cadmium, are not substantially present in materials composing everyday life products. Even more important is to ensure that these materials do not release any such heavy metals in the environment or in food or water. Heavy metals such as cadmium and lead are never intentionally added in soda-lime silicate flat glass, therefore their presence in glass may only derive from traces of naturally occurring circumstances. To substantiate and quantify this fact, Glass for Europe commissioned an independent institute to undertake an unprecedented measurement campaign on flat glass products from all over Europe. This measurement campaign, whose methodology and results are presented on the next pages, confirms that flat glass products produced in Europe contain insignificant amounts of lead and undetectable levels of cadmium. All the more, migration levels are so low that, even when using the most precise analytical technologies, most migration results are below the measurable detection limits. The lead content ranged from 3.3 to 9.3 mg/kg. Cadmium was always below the detection limit (0.6 mg/kg). To give an idea of the order of magnitude of these values, comparing them with the Dutch soil quality standards, the content of lead in flat glass is at least 9 times below the target values established for soil. Similarly, cadmium is also well below the target value. 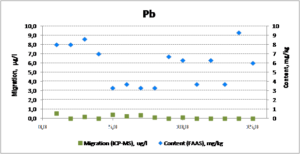 The migrations of lead and cadmium analyzed by GF-AAS were always below the detection limits, 2.0 and 0.3 µg/l respectively. As a point of reference, these figures on potential maximum migration are 5 and 17 times below the limits established for lead and cadmium in the European Drinking Water Directive. When addressing issues of lead and cadmium in flat glass products, European decision-makers should carefully consider whether or not additional testing requirements bring any added-value, in light of the insignificance of release and migration shown by this analysis. The study covered all main types of flat glass produced in Europe, i.e. float glass both clear and colored as well as clear patterned glass. The fifteen flat glass samples analyzed were collected from fourteen different European manufacturing plants located in eleven countries across Europe. The study therefore covers all EU countries where Glass for Europe members operate glass making sites. The tests and analyses were performed by the ‘Stazione Sperimentale del Vetro’ (SSV) in Italy. SSV is an independent accredited laboratory, specialized in glass and glazing processes and products. Samples and results were anonymised by the institute to ensure complete independence and confidentiality of results. SSV was also chosen for its ability to perform the analysis using two distinct technologies, thus providing more accuracy (lower detection limits) and more confidence in the results. More specifically, the study involved analysis of lead and cadmium content using flame atomic absorption spectrophotometry (FAAS), according to the UNI standard 10938:2001. The migration test followed the ISO standard 6486:1999 (acetic acid at 22°C for 24 hours). The migration solutions were then analysed by flame atomic absorption spectrophotometry with graphite furnace (GF-AAS) and with inductively coupled plasma mass spectrometry (ICP-MS). The ICP-MS analytical equipment allows for lower detection limits but is not available in many laboratories. Lead content in the glass samples tested ranged from 3.3 to 9.3 mg/kg, with an average value of 5.81 mg/kg. The migration of lead analyzed by GF-AAS was always below the detection limit of the equipment (2.0 µg/l). In addition, the analysis performed by ICP-MS showed that half of the results were still below the the detection limit of the equipment (0.1 µg/l). With ICP-MS the results ranged from <0.1 to 0.55 µg/l, with an average value of 0.13 µg/l. When referred to the surface, the results provide an average value of 0.0080 µg/dm2, with a maximum of 0.028 µg/dm2. The cadmium content in the glass samples tested was always below the detection limit (0.6 mg/kg). As for cadmium migration, results of the test were always below the detection limits of both techniques, GF-AAS and ICP-MS, respectively 0.3 and 0.1 µg/l (or 0.02 µg/dm2 and 0.005 µg/dm2). Thus, in the case of cadmium, both content and migration were always below the detection limits of the techniques used in the study. To that end, the European Commission is developing and reviewing migration limits for materials that may come in contact with food. Dutch soil quality standards establish groundwater and soil target values. Target values provide an indication of the benchmark for environmental quality in the long term, assuming that there are negligible risks for the ecosystem. The target values for lead and cadmium are respectively 85 and 0,8 mg/kg dry matter. Graphite Furnace-Atomic Absorption Spectrometer (GF-AAS). The European Drinking Water Directive (DWD), Council Directive 98/83/EC, concerning the quality of water intended for human consumption establishes maximum concentration limits for lead of 10 µg/l and for cadmium of 5 µg/l.